Have you tried applying for your Liberian passport and got rejected because the photo was not high quality or didn’t meet all the requirements? Well, we can easily help you rejection again and if you haven’t, why risk it? Come to our store to ensure that your Liberian passport photo or visa photo is accepted the first time. You won’t need to worry about it as we guarantee to take a photo of you that meet all the required criteria made available by the Embassy of Liberia. Reload Internet can snap, print and produce your Liberian passport photo or visa photo. Our studio has the latest camera and digital printing technology and our team of professional photographers will use the correct lighting and background to capture your Liberian passport photo or visa photo. We guarantee that if your visit Reload Internet for your Liberian passport photo or visa photo, it will be accepted the first time you submit it to the Embassy of Liberia along with your application. Our store is located in Paddington, London, on Praed Street – the same street as both Paddington train & tube stations – making us accessible for people in every area of London. 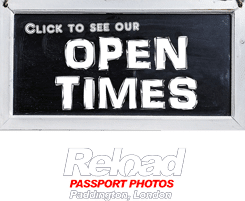 We are also open 7 days a week here at Reload Internet, so you can come and visit us on a day and time that suits you! You have to make sure that the Liberian passport photo or visa photo that you submit with your application is of high quality, if not, it will likely be rejected by the Embassy of Liberia. Instant-print photo kiosks are not capable of taking pictures that meet the standard of quality needed to get your application accepted. 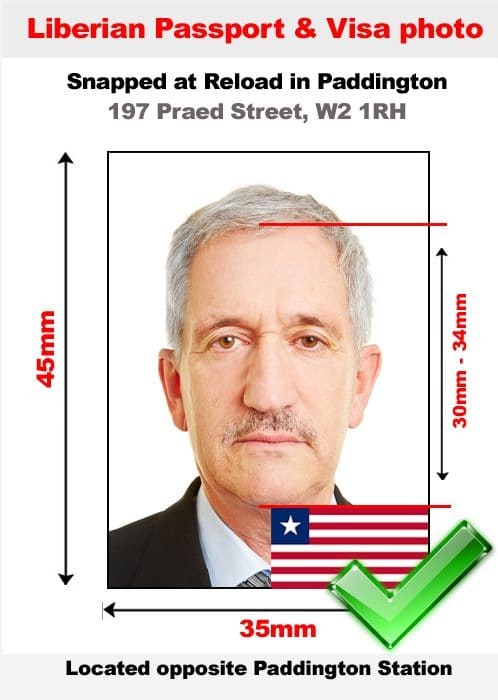 A huge amount of customers who have been rejected have visited our store for help with their Liberian passport photo or visa photo. You should not use an excessive amount of makeup or any other thing that can alter your face features in the photograph. Three 45 mm x 35 mm identical photographs must be submitted. The photos must clearly show the applicant’s facial features in a straightforward position. The background needs be white and plain. Photos can’t be more than 6 months old. The applicant needs to have a neutral expression in the photo. The applicant face must be square to the camera, not turned or at an angle. The face must cover 65% – 75 % of the photo. The size of the head should be 30 mm to 34 mm from crown to chin. You must look at the camera directly, with your eyes opened and visible. The camera lens must be at the eye level of the applicant. The face must be evenly illuminated. Reflections, shadows and red eyes must be avoided. The applicant can’t be using glasses as it will guarantee your photograph getting rejected. The photo should be printed on a high-quality paper with a minimum print resolution of 600 dpi. Headwear is forbidden unless it’s being used for religious, cultural or medical reasons. The face must be nicely focused in all areas, rich in contrast and clear. If your Liberian passport photo or visa photo does not meet every single one of the requirements stated above, then it is highly likely that your application will be refused due to a photograph error when you submit it to the Embassy of Liberia. Come to Reload Internet to ensure that this does not happen to you! Our specifications are taken directly from the official Embassy of Liberia’s guidelines on passport and visa photographs, which you can find here.